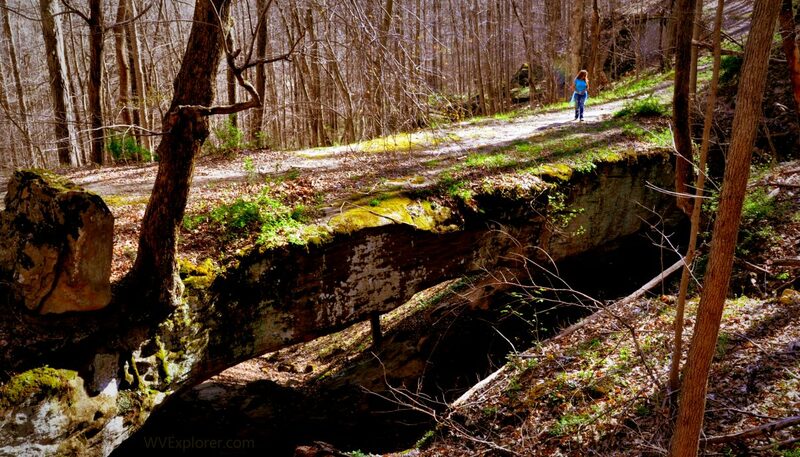 One of several natural bridges in southern Roane County, this natural bridge formation north of Clio, West Virginia, is apparently the largest. The sandstone bridge outcrops along the southern flank of the ridge west of the Shavers Fork of Lefthand Run. The bridge is formed where a small, swift-falling stream has worn through a cliff. For many years a rural route, now a trail, used the bridge in its descent from Vineyard Ridge to Shavers Fork. The owner of the property on which the bridge is located allows pedestrians to walk to the site. Directions: From Left Hand, W.Va., follow Roane County Route 36 north 2.7 miles to a left turn onto Vineyard Ridge Road. Follow the latter 1.4 miles to left onto Little Lefthand Road, then follow the latter 0.4 miles to left onto Natural Bridge Road. Continue 1.1 miles to gravel parking area at end of road. Walk through gate, and descend hollow approximately and eighth of a mile to the bridge.